A major political campaign, with all its excitement, activity and extensive news coverage, can bombard you with images and impressions that leave you with very little real information about candidates and their stands on issues. This voter’s guide will help you follow the campaigns, listen to the candidates and sort out what you need to know to pick a candidate. 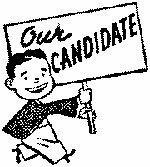 Television and Radio Commercials: What did you learn about the candidate, the qualifications and the issues? Did the ad affect feelings or attitudes? Is that good or bad? Direct Mail: Realize that computers enable personalized appeals to selected groups. Is that good or bad? Why? Pamphlets and Flyers: Read carefully. They may have substantive information or may contain lies, distortions or evasions. Look for accusations such as untrue characterizations. Emotional Appeals: Listen carefully. Is the candidate making you angry so you accept arguments without question? Is the candidate looking for your sympathy? Look for facts, not manipulations. Endorsements: What qualifications does the endorser (usually a “celebrity”) have? Bandwagon: Is everyone indeed supporting this candidate? Does it make a difference? Name-calling: Watch for ignorant or absurd words (“his sister was a thespian”), inflammatory distortions of records. Don’t be sidetracked by attacks based on family, ethnicity, gender or race that make no difference in performance. Loaded Statements: Watch for implications, half-truths. Baiting: Badgering and intimidation are unfair campaign tactics. What is an organization’s reputation? What is the group’s bias? Find out by asking, including the reporter who wrote the story. Ask the supervisor of elections who the backers or campaign organizations are. What votes were included in the rating scale? What does this mean? Who was included? How many votes were cast? Who sponsored the poll? Were all the figures released? Was the poll affected by a key event? What questions were asked? How were they asked? Who was interviewed? How were they selected? How many were interviewed? What is the margin for error? How many “undecided” answers were given? How long ago was the poll done? Passing the Blame: Watch for broad accusations. Does the candidate give direct answers? Watch out for candidates who take about benefits and never mention costs or actual plans. What experience does the candidate have to qualify for this particular public office? Has the candidate ever attended a meeting of the body to which election is sought? Has the candidate ever lobbied or showed an interest in the political process? Is the campaign open, straightforward, issue-oriented? Is the candidate accessible, willing to debate? Do campaign ads provide clear information on issue positions? Are the candidate’s qualifications clearly stated” Will they count in public office? In a broadcast interview, who is the interviewer? Are the answers to the point or evasive/ Are follow-up questions allowed? Where does the candidate make appearances? What are the implications of this?